Play guitar like a master with no experience necessary! The Guitar Meister is a little electronic device that makes a big guitar sound! Don't worry if you don't have a guitar controller. 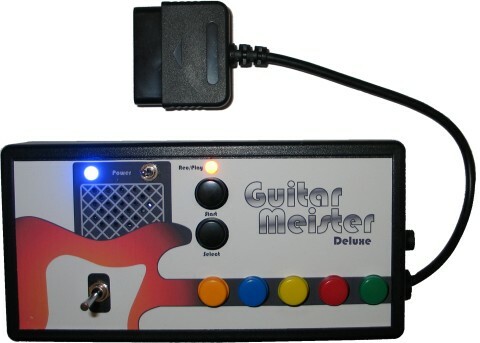 With the Guitar Meister Deluxe, you can play with the built-in buttons or a guitar controller. But, really, you can find PS2 guitar controllers cheap on eBay, CraigsList and even Amazon. The Guitar Meister and Guitar Meister Deluxe are available as kits. The kits come with the circuit board and all of the parts you need to build the Guitar Meister. The kits do not come with a fancy enclosure. For that you need the finished product - or build your own enclosure. The Guitar Meister is built around three chips: the Microchip PIC16F819 microcontroller, the Nuvoton ISD17240 ChipCorder® sound chip, and the Microchip MCP4152 digital potentiometer. To state it simply, the microcontroller reads button press and whammy bar position from the PS2 guitar controller and tells the ChipCorder® what sound to play, and at what pitch. If you have a background in electronics, and would like to know more about the design and operation of the Guitar Meister, then read on. There is a lot of information online about how to read a PS2 controller with a microcontroller. The best site I have found is on CuriousInventor.com. It is a very comprehensive article which references the work done by many people to understand the PS2 controller communication and command protocol. Every PS2 controller contains a microcontroller chip inside it that reads its own buttons and joysticks (the whammy bar is really just a one-axis analog joystick). That embedded microcontroller then communicates with the PlayStation, or, in our case, the Guitar Meister. The communication protocol it uses is SPI. That is very convenient, because most chips that are designed to interface with microcontrollers also use SPI. 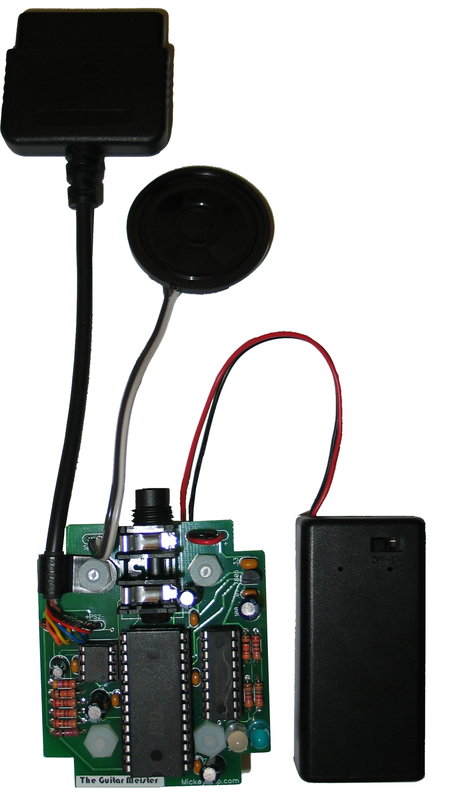 In fact, the ChipCorder® and digital pot used by the Guitar Meister also use the SPI protocol. I am not going to go into great detail here on the SPI protocol. You can read the Wikipedia article on SPI for a good introduction. Suffice it to say that the PS2 controller, ChipCorder® and digital pot each connect to their own chip select pin on the microcontroller, and they are all connected to the same shared clock, data-in and data-out pins. The microcontroller pulls the appropriate chip select pin low then communicates with each chip. There are hundreds of microcontrollers on the market, in fact, there are hundreds of PIC microcontrollers. The choice of which family of microcontroller to use is tantamount to one's choice of religion, so I will just say that I like PICs and leave it at that. I will, however, explain my reasoning in choosing the PIC16F819 from among all of the PICs. I wanted to choose the cheapest and smallest (least number of pins) chip that had all of the capabilities that I needed. The Guitar Meister Deluxe (the one with all of the buttons on it) uses 16 I/O pins. So, an 18-pin microcontroller is the minimum size I needed. I wanted a chip with hardware SPI because it requires almost no program memory and is more bullet-proof than software SPI implementations. Finally, I needed just under 2K of program space and just under 256 bytes of RAM. The PIC16F819 fit all of my requirements. The Nuvoton ChipCorder® sound chips are great. The technology is used in thousands of products from answering machines to toys to talking greeting cards. The chip was originally made by a company called Information Storage Devices (ISD), which was bought in 1998 by WinBond who spun off the Nuvoton division in 2008. The chip is not exactly high fidelity, but the sound quality is great for this application. The sound storage technology that is used in the ChipCorder® is unique (you can read about it on the Nuvoton web site). The main issue with the design is that you cannot program the ChipCorder® with exact bytes like you would an EPROM, you have to actually play the sound and record it on each chip. To playback sounds sequentially, like in an answering machine application, is easy. However, to play a specific sound on demand, the microcontroller needs to know the memory address where the sound starts and stops. Therefore, it is critical that every Guitar Meister chip is programmed with the guitar sounds in a very consistent way so that the memory locations of each sound are the same from chip to chip. To accomplish that, we use the ISD-ES17XX USB development board ($187 from DigiKey). The dev board allows batch programming of WAV files into the chip via USB. As all of you circuit benders know, most sound chips have a timing resistor that controls the speed of recording and playback. This is where the digital potentiometer comes in. The sounds are recorded at 12 Khz using a 60K resistor. The Guitar Meister has a digital pot which is controlled by the microcontroller. The guitar controller sends the position of the whammy bar along with the button press information. The microcontroller converts that into small changes in the timing resistor value and allows you to bend the pitch of the guitar sounds being played back. The Guitar Meister has two LEDs. The blue LED is a power indicator, which also blinks if there is a communication failure with the guitar controller. I have tested it with seven different guitar controllers and it works perfectly, so if the LED is blinking it is probably because the controller's batteries are dead or it is not plugged in. The other LED is a red and green bi-color LED, which glows yellow-orange when both are turned on at the same time. It is used to indicate record and playback state. There is one more pin that is used on the microcontroller. That is for the external amplifier jack. That pin has a pull-up resistor on it. When there is no plug in the jack, the pin is grounded and when a plug is inserted the pin goes high. That tells the microcontroller that it should send the output to the amplifier jack. The reason for that scheme is that the ChipCorder® has dedicated speaker and amplifier output. To get the best sound quality, you should use them both, not just pipe the speaker output through the amp. So, the microcontroller monitors the amp jack pin and sends the appropriate command to the ChipCorder® to tell it which output is active. 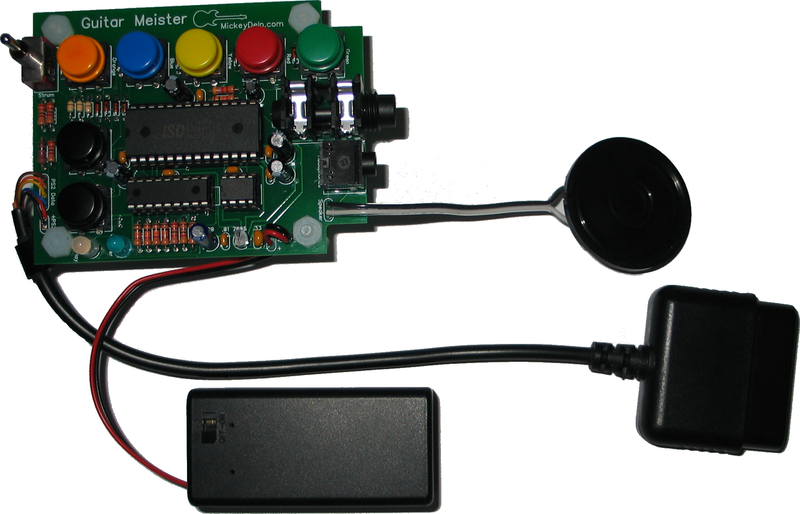 The Guitar Meister Deluxe also has seven buttons and an up/down strum switch which are connected in a 3X3 matrix to six pins on the microcontroller. I actually designed the Deluxe edition first, then decided that many people would want a smaller, simpler version, so I removed the buttons and the headphone output jack. That's it. Simple, right? Before you ask (as several people already have), the actual microcontroller code is proprietary, so I cannot give that out. If you have any questions about the circuit design, please feel free to contact me. Electric guitar sounds were recorded specifically for the Guitar Meister by Isaac of Austin Virtuoso Guitars. Acoustic guitar sounds are by NoiseCollector via freesound.org. Bass guitar sounds are by FaireDesVagues via freesound.org. Special thanks to Paula Sangleer, voice actor and radio personality, for her voice-over work on the video.